Comfortably sitting among the more popular medium-budget clippers, Andis Speedmaster 2 is a bit different. In contrast with standard models with stainless steel blades, the Speedmaster blades are ceramic. Ceramic blades stay cooler and they generally stand the test of time better. Add to this the Speedmaster 2 clippers’ sleek design and you’ve got a more than a decent machine. I’ll elaborate on these points and some other things in this Andis Speedmaster 2 review. Considering its price range, the Speedmaster 2 clipper really pleases the eye. Its body is made of chrome-plated plastic, very durable and sleek in design. The machine is lighter than other Andis clippers at 0.9 lbs and measures 6″. The weight is a perfect balance – it’s just heavy enough for proper hair cutting. Nobody likes clippers that are too lightweight, because your grip will suffer then. Speaking of grips, the Andis Speedmaster II clipper has a black rubber section on its top part. This further helps in terms of ergonomics. As if this wasn’t good enough, Andis have gone an extra mile with this cutter. You’ll also receive a total of 9 Speedmaster guards – sizes 1/16″ to 1″. Of course, you’ll get clipper oil, blade cleaning brush, and a blade guard. A very, very sweet deal. I already mentioned earlier in this Andis Speedmaster 2 review how unconventional it is for a medium-budget clipper to have ceramic blades. This is a total godsend because Andis ceramic blades stay way cooler than your usual stainless steel ones. The brand advertises 75% cooler blade action here, which might be a bit over the top. Nevertheless, you will feel the difference and you’ll love it. 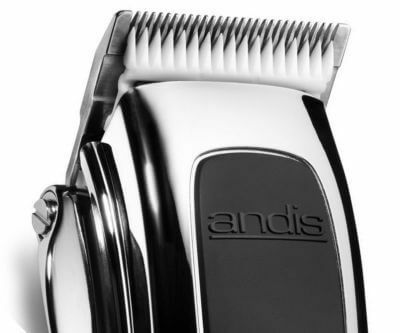 As an Andis adjustable blade clipper, the Speedmaster 2 allows for blade adjustment. You can pick a length from #1 (1/8″) to #000 (1/100″.) The ceramic blades cut sharp and are durable, making this model a great fading clipper. It also goes through the thicker ethnic hair types without hassles. The motor is a pivot one and runs very quiet. Few other clippers as a whole, not only Andis’, can take pride in such a quiet operation. The Speedmaster 2 clipper’s motor is decent, but not great. A few people have asked me for an Andis Speedmaster 2 vs Andis Master comparison. I’ll be blunt: there’s not much to compare. While the Speedmaster 2 clipper is way cheaper than the Master, and runs cooler, that’s where it all ends for it. The Speedmaster has a 3400 strokes per minute pivot motor, while the Master can cut at up to 14 000 strokes. You can’t really compare the output those two models have. In addition, the Master simply smashes it as a fade clipper. Similar conclusion can be said about the new Andis Pro Alloy XTR and the Speedmaster. If the Speedmaster 2 clipper can be compared with another clipper, this would be the Oster Fast Feed. Both run on pivot motors and are in the medium-budget clipper pool. The Fast Feed isn’t that shiny and elegant, but I’d say it performs a little better. A tough match, in any case. If you’re looking for a heavy-duty clipper, ready to easily cut in bulks, this model might not be your optimal choice. As I already mentioned, the root is the pivot motor. 3400 strokes per minute are actually decent, but other barber clippers simply perform better. Pivot motors simply get beaten by electromagnetic motors when it comes to cutting hair in bulk amounts. You can use the Speedmaster 2 as your hair clipper for home use, or as a supplement to a main cutter. If you plan on doing buzzcuts and short haircuts, it’s king. It’s also good for getting some tight fades. But it won’t be your best bet for heavy-duty tasks. The Andis Speedmaster 2 clipper also vibrates a bit. While it’s not as serious as some of the barber clipper tough guys, you’ll feel it. Honestly, that’s not that much of a problem to me. Especially with a lighter body like this model, you can’t expect a hair cutter to stay still all the time. For perfectionists, the Speedmaster 2 doesn’t have notches to keep things extra tight like the Master. Anyway though, everything stays secure and you shouldn’t expect any slips or operation-related headaches. To summarise this Andis Speedmaster 2 review, the clipper is a great bang for your buck, overall. Cosmetic fancy things put aside, the ceramic blades and quiet operation make it a real winner. While the slightly weaker motor and vibrations are a shortcoming, they aren’t a critical drawback. It’s simple: this is not a true Andis barber clipper. As a hair clipper for use at home, however, it’s more than a reasonable choice. If you cut shorter hair, do some fades or want to do some quality beard trims along the way, the Speedmaster is your way to go. Not only are they cheap for the quality you get, but also grab a nice set of additional accessories. I say go for it!